Schröder Group offers sheet metal working industrial companies a fully automatic bending centre based on folding machines of the Evolution-Series. The Power-Bend-Center is designed to be smoothly integrated into production plants for electronically controlled machining sequences. It is a complete solution from one single source: software and mechanics originate from Schröder Group’s research and development and are perfectly matched. In the production planning, the software control POS 3000 with its simulation and 3D presentation serves to program bending programs and to control the machine, the tool changer and the manipulator during operation. In the heart of the Power-Bend-Center, there is a modified folding machine of the Evolution series with a working length of 3,200 mm which is able to bend sheet metals up and down. A gripping device takes the sheet metal that is to be processed from the previous processing step. These machines could be for example laser cutting machines or automatic punching presses. The sheets get positioned and fixed on the feed-in table. The manipulator stamp fixes the sheet, turns it and is able to move it around the X-axis – a universal gauge for all purposes. A high-resolution camera system controls the position and ensures highest precision. Other special features of the Power-Bend-Center include an extremely fast folding beam with speeds of up to 300°/sec as well as a clamping beam with speeds of up to 400 mm/sec and an augmented opening height of 850 mm. That enables the fully automatic production of very big and bulky work pieces such as housings and coverings. The standard equipment of the Power-Bend-Center also includes a further improved, automatic tool changer in the clamping beam of the folding center. While the new sheet gets positioned, the tool changer sets up the suitable tool stations. This, not only enables an extremely efficient and fully automatic production of large series but also of small batches and single pieces. The manipulator, the machine and the tool changer are controlled via the software control POS 3000 that has been developed in-house by Schröder. In the production planning, the CAD data of the work pieces get loaded into the POS 3000 folding program on a computer. A previous machine – e.g. a laser cutting station – opens the folding program when transferring the sheet. POS 3000 processes data in formats such as DXF, BPX and the Trumpf format *.geo. Additional flexibility: On request, the folding programs can also be entered or edited using the touch display on the machine. 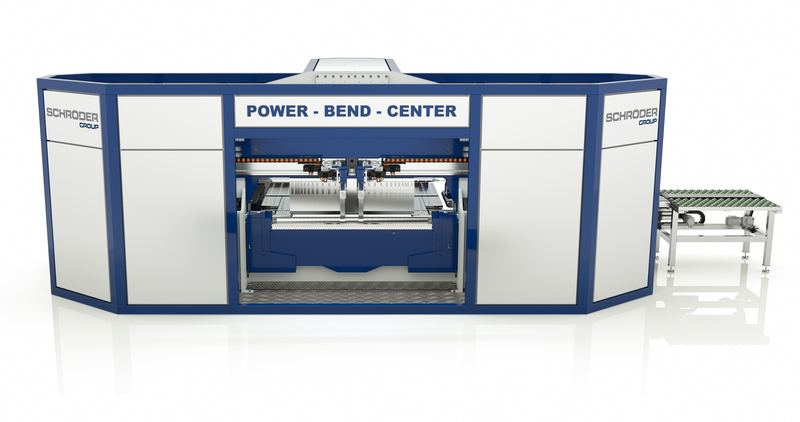 The Power-Bend-Center can be configured flexibly and is available with alternative material feedings and –output stations as well as with different working lengths and folding capacities. When it comes to optimal dimensioning and configuration as well as integration of the Power-Bend-Center into installations, processes and IT-systems, customers get supported by an expert team of Schröder Group.